Before Staging Design: Living room before home staging. After: By angling the sofa, your eye is drawn to the beautiful fireplace. 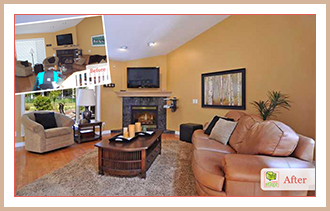 home that is move-in ready based on their personal taste. It’s easy to know what works for you and your family, but what will work for the buyer? Home staging design isn’t decorating or personal taste, it’s a key marketing tool sellers use to get their properties SOLD! This is why professionally staged homes show better than unstaged homes; they are designed for the buyer. Does your property require extra furniture to properly Furnish Your Floorplan? Take advantage of our staging safe inventory. To find out if your property could benefit from staging, contact Jen today for your personalized Home Staging Assessment.